Did you know that sitting in the seat of a Bus – well, any vehicle actually, over long periods daily can contribute to spinal compression and over strain of certain back muscles? Ask any Bus Driver and they can tell you that even when they get up from that driver’s seat they still feel like they’re sitting down. Their lower back is almost locked in a seated position, and the pain in their lumbar region can often be sickening. The patented system eliminates painful pressure points and promotes consistent blood flow for a longer, more comfortable ride. Memory foam can’t do it. Gel seats can’t do it. Only genuine AIRHAWK can do it. And it’s portable – use it anywhere else you sit. The non-skid material will keep the cushion secure on your seat. ...then you can relate to the aches, cramping and numbness that most office workers suffer from. Imagine having your very own air cushion that is exactly like a water bed... for your bottom! 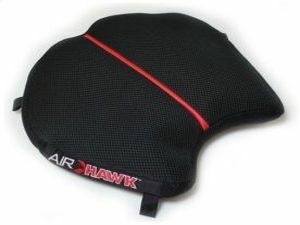 The AIRHAWK LTV Cushion is the perfect solution for your vehicle. You have a choice of a fabric covered cushion or a leather covered cushion. The leather cushions are a popular choice for luxury vehicles (as well as office chairs). 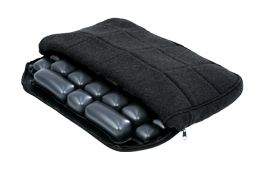 Both fabric covered cushions and leather covered cushions have the benefit of the AIRHAWKs patented weight distribution system over the air-filled cells. Welcome to AIRHAWK Australia, the home of AIRHAWK Comfort Seating Systems in Australia. For over 18 years we have been providing comfort and seating solutions for people across all types of lifestyles and industries. From motorcycling, mining, transport, farming and aviation, to 4wds, forklifts, cars, motorhomes, office chairs, and gophers. Our systems have been reducing back pain and making the task of sitting for a living or for pleasure, safer, painless and more comfortable. Redistributes weight away from pressure points to improve blood flow, relieving pain and discomfort. Provides a medium between you and the seat, allowing you to adopt a comfortable posture instead of conforming to the shape of the seat. No matter what kind of seating issues you may have – Airhawk Australia is here to assist you with our patented Shape Fitting Technology. Enjoy browsing our site and should you have any questions please feel welcome to contact or call us. MOTORCYCLE VIDEOS - HOW TO SELECT, INSTALL, INFLATE, ADJUST YOUR AIRHAWK. Product must be returned post paid and in good condition within 60 days of purchase date, along with proof of purchase. Full refund minus $20 restocking fee.